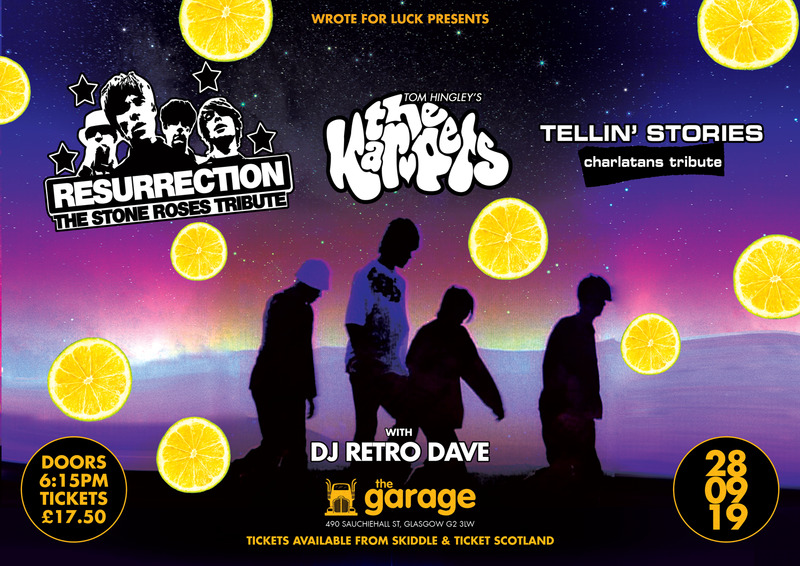 Resurrection Stone Roses return to The Garage with support from Tom Hingley&apos;s Ker-Pets + (Charlatans tribute) Tellin&apos; Stories + DJ Retro Dave. Resurrection Stone Roses + Tom Hingley's Ker-Pets + Tellin' Stories. Resurrection return to The Garage, Glasgow for the second year running. The band formed in 1998 in Glasgow under another guise & toured the length & breadth of the UK & Ireland performing to hundreds of thousands of |Stone Roses fans. The band toured with Mani from The Stone Roses for 3yrs & performed with him live onstage at King Tut's Wah Wah Hut, Glasgow. Resurrection are the UK's finest Stone Roses tribute act & continue to fly the flag of 'arguably' the greatest British pop band of the last 4 decades. Tom Hingleys - Ker-pets will be joining Resurrection for this incredible show. Tom Hingley is better known as the voice & front-man of indie legends Inspiral Carpets. The Inspirals recorded some of the best music of the late 80's & 90's with top 40 hits incuding This Is How It Feels, She Comes In The Fall, Caravan, Draggin' Me Down, Saturn 5, I Want You & Joe. With no fewer that 11 top 40 UK singles & 4 top 20 UK albums. Tom is the voice of a generation & his Kar-Pets will be performing many of Inspiral Carpets biggest hits. Tellin' Stories (Charlatans tribute) will be performing the most memorable of The Charlatans singles with a selection of b-sides & album tracks. The group were formed in 2018 in Glasgow & include members of Stone Roses & Doors tribute bands north of the border. Prepare to be amazed by this groups dynamic performance. DJ Retro Dave Anderson will be spinning the finest Indie tracks for this one! 14's+ Under 16's must be accompanied by an adult.